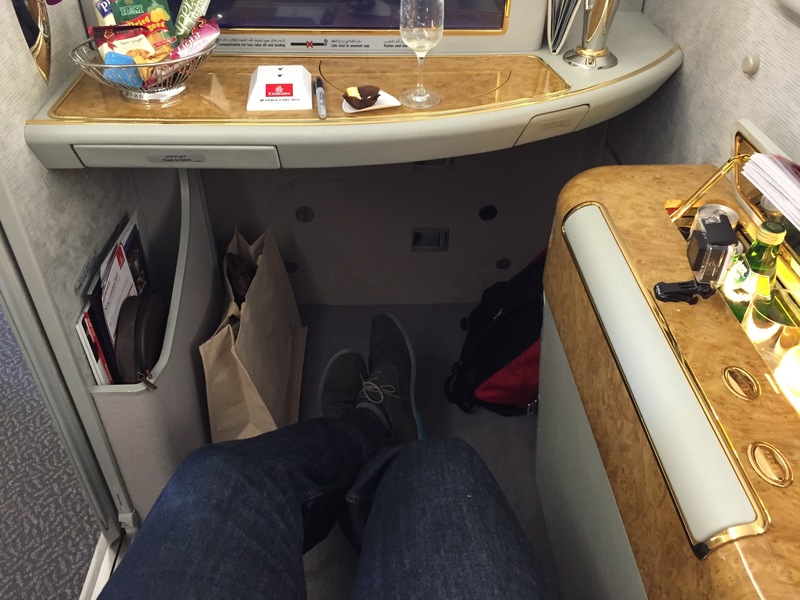 Emirates vs Etihad: Battle of the Seats | No Mas Coach! 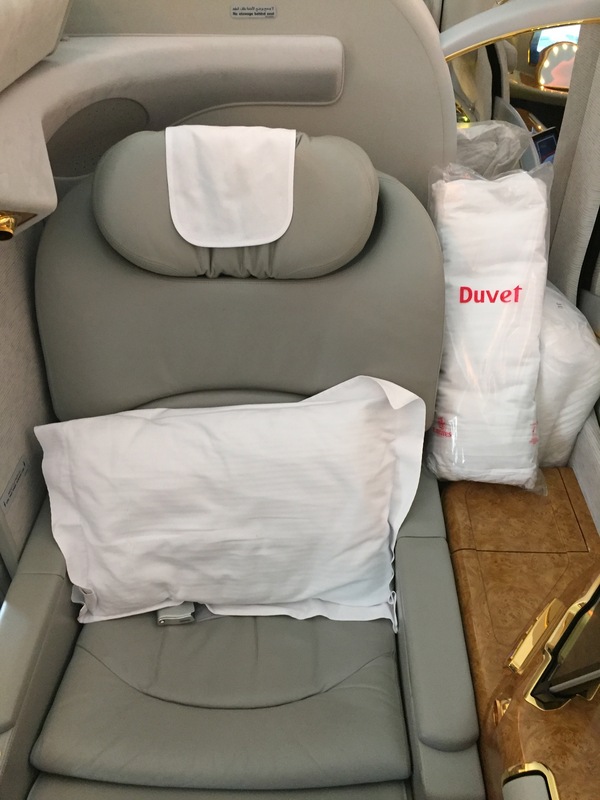 Once again we’ll start this post agreeing that when it comes to First Class and luxury, the Gulf carries are most definitely the way to go, as they offer more than any other airline does for similar routes. From their top notch champagne and caviar service, to their on demand meals and their spacious seats and suites to the million amenities, one can’t help but feel pampered at 40,000 feet in the air. But when it comes to the seats – or in this case, the suites, how do they really stack up? This is Emirates vs Etihad: Battle of the Seats! 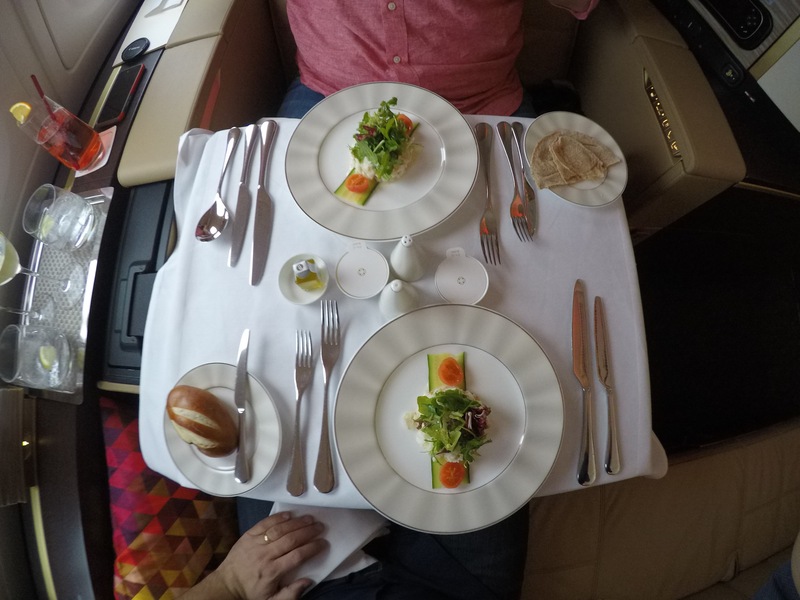 Emirates offers their exceptional First Class service in the upper deck of their A380s to twelve passengers, who will be enjoying their own Private Suites in the sky. 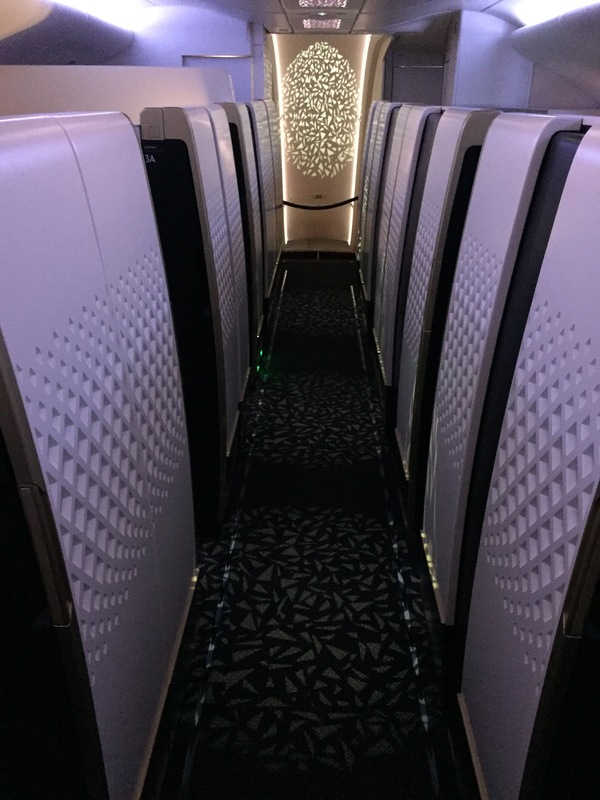 While this might sound like a lot for a first class cabin, it certainly doesn’t feel crammed, I’m guessing because of its very light shades of beige and golden details throughout (yes, kitsch AF…). Let’s go through a list of items you can expect to enjoy when flying this product. Emirates First Class seats are plenty wide and super comfortable, they’re cushy in all the right places and fully adjustable into different positions for your maximum enjoyment; from fully upright for take-off to fully flat for sleeping to dining mode, which basically means if you’re short like me, you’re close enough to your meal and not dripping food all over your legs and torso. Headrest and legrest are also adjustable to make for an even more pleasant flight. 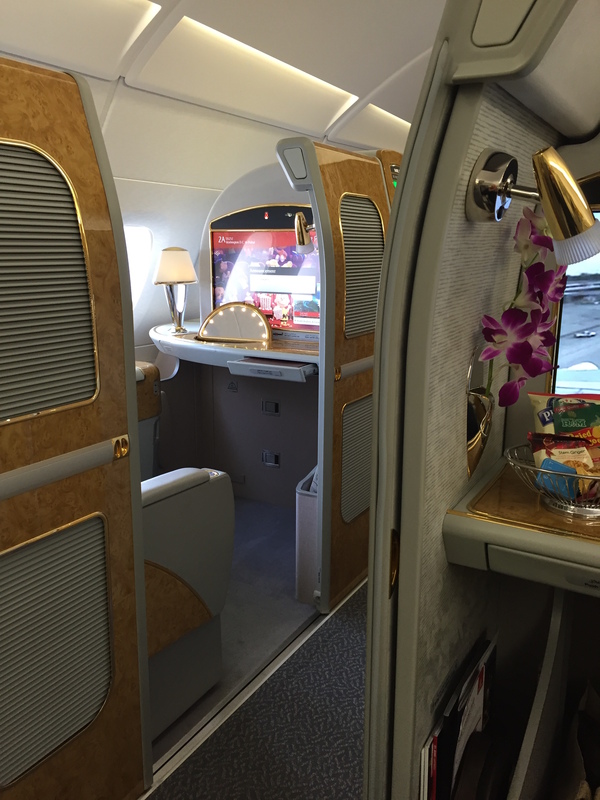 One of the great things about this Emirates product is that it is a Suite, and it really does feel like one. It is your own area separate from everyone else in the cabin. This means you can shut off your privacy screens with the touch of a button on your armrest and two dividers will slowly slide and enclose you within your suite. 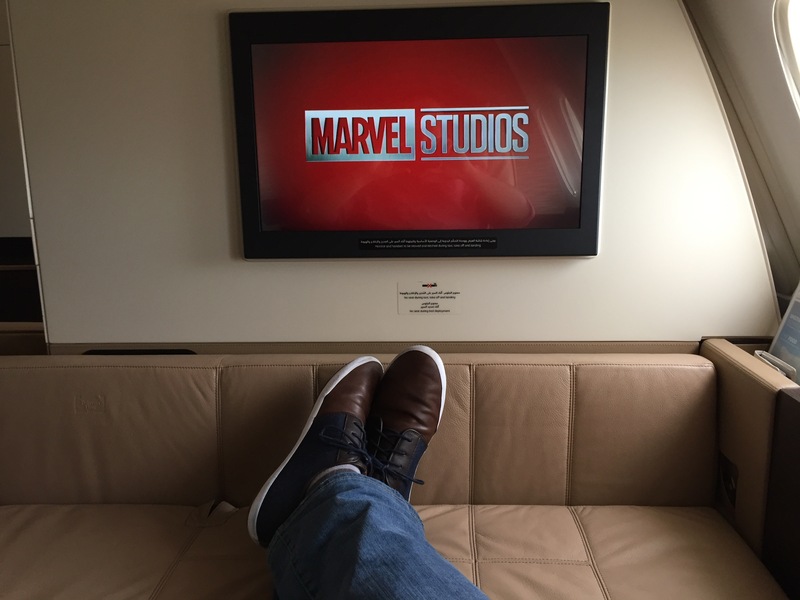 Even though they’re not floor to ceiling walls and someone my height can still see inside your suite while walking past, they still provide all the privacy you could ever want in the sky. For those of us flying in tandem, I’d suggest selecting seats E and F so that you can sit together and enjoy each other’s company. If at any point you get tired of one another, you can with the touch of another button, have your privacy screen go up in between the seats and separate you from your seat mate (aka, he snores). 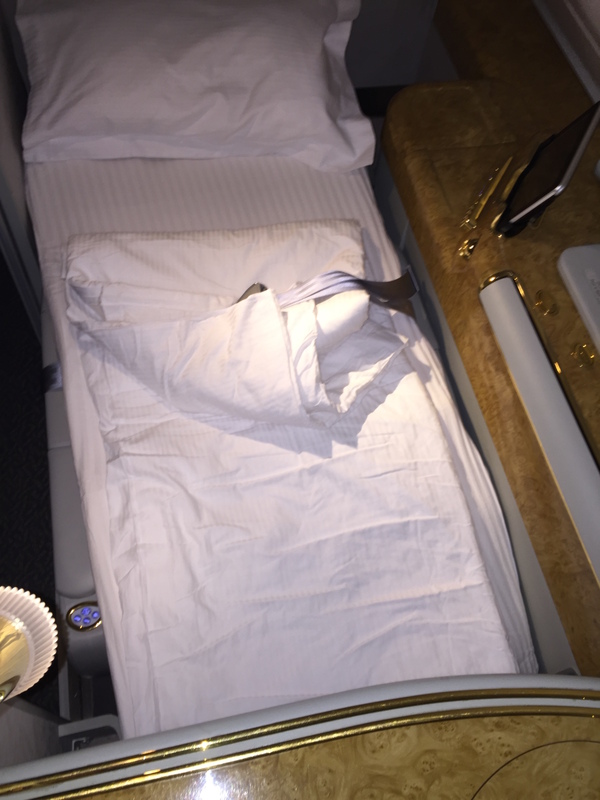 The seat fully turns into a bed, once you request a member of the crew for turn down service. They will bring over a mattress pad that’s thick enough to make it impossible for you to feel the spaces between the seat cushions below, as well as a duvet and an extra pillow. 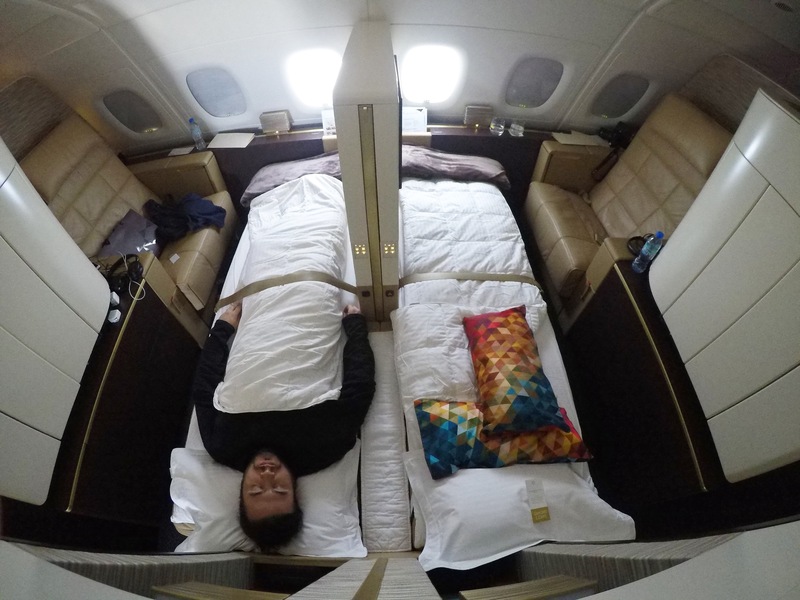 We’ve always been lucky when flying them and have always had an almost empty cabin, so we managed to get them to make our beds in the window seats next to us so that they’d be ready for when we wanted to pass out and we could easily migrate to our seat to have breakfast once we’d wake up. Of course you already got your moisturizing pajama when you boarded so you’re good to go (to sleep). 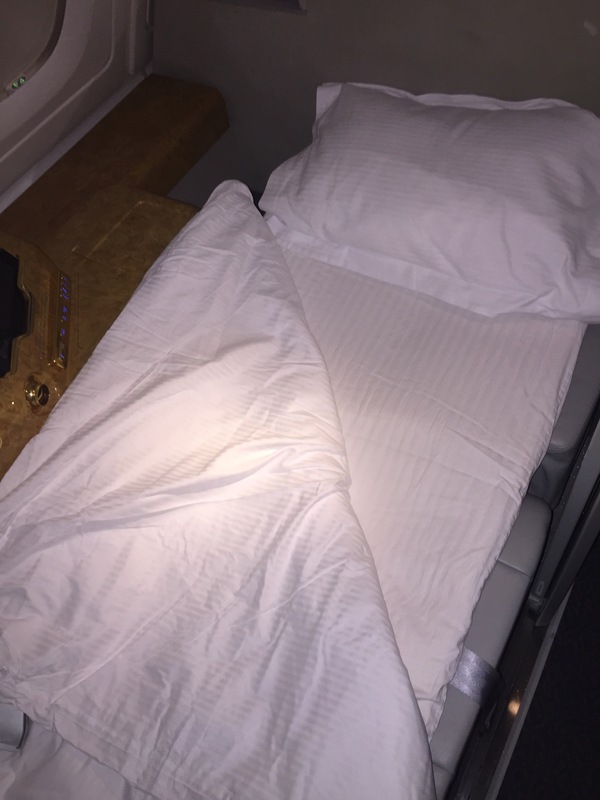 Emirates pillows are NICE, as in they’re filled up enough to be comfortable, but not too much to be unusable. They pillow cases are soft heavenly cotton and feel nothing like crappy airline pillows. They are in fact much better than the really expensive ones I have back home (I’ll take a gifted pillow whenever Emirates feels line sending me one). Every time we’ve flown and slept, I’ve received two pillows. I’m not sure if this is standard procedure or simply because the other suites were empty and they felt like pampering me, but I feel like two is the magic number for me to be comfortable. 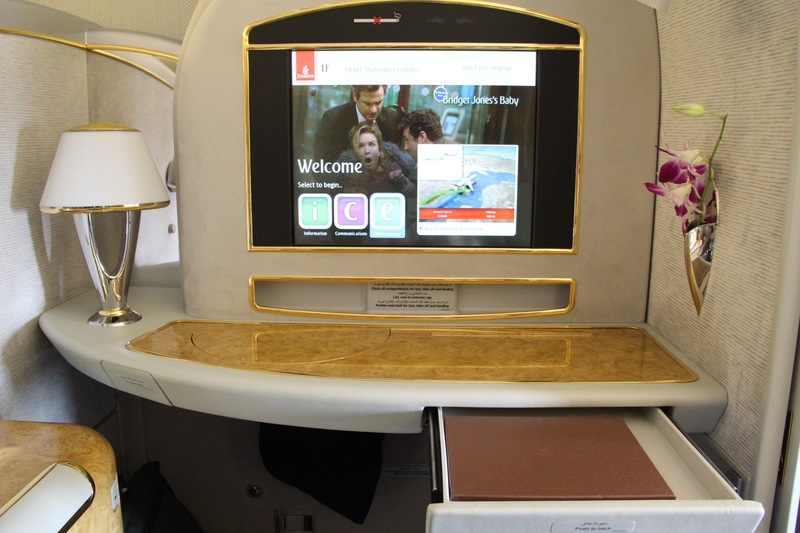 Emirates equipped their A380 suites with 32″ IFE touch screens. They are massive. They’re so large they make you want to take a step back, which luckily isn’t a problem considering space isn’t an issue in first class. I am always weirded out as to why on earth these screens would be touch screen considering that a) The seat is at least two arm lengths away from the screen and you have to literally get off your behind to reach it, b) Your seat is equipped with a tablet that fully controls your IFE and c) There is ANOTHER control under your armrest to control your IFE. There’s like a million movies and shows, and games and lord knows what else. I remember I started watching ‘Gone with the Wind’ until I passed out. And yes, it’s a table, not a tray. Also massive, and it’s spans from your vanity just below your screen all the way to your seat, and from side to side inside your suite. It pops out from the side of your seat opposite the aisle with the touch of a button, and needs to be pulled out and into position. The crew members will usually do this for you as they’re setting it up for your meals. The table is extremely stable and supports the full weight of your meals and even your arms on top without the slightest movement. 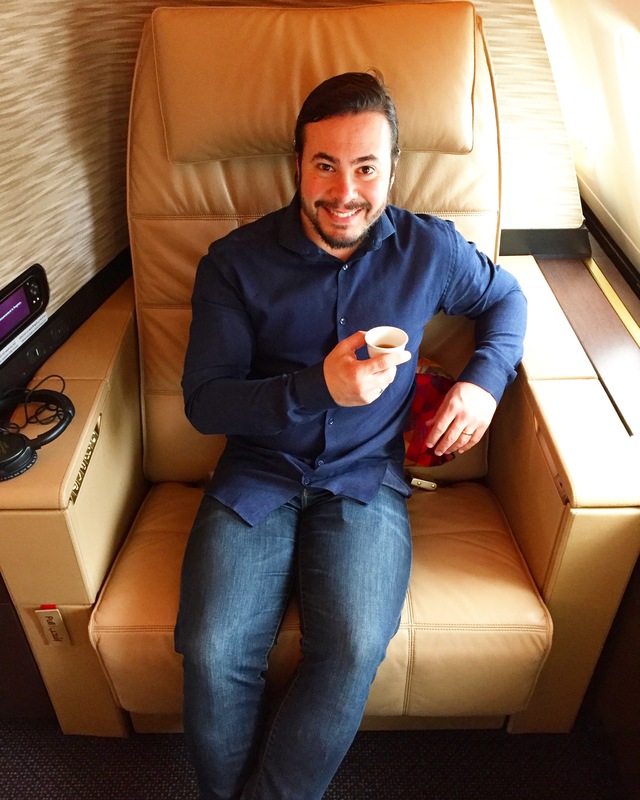 To this day I am still wondering why on earth would Emirates place a mini-bar on each of their first class suites, but I guess the simplest answer is because they can. Your mini-bar comes stocked with Pepsi products, usually a Pepsi, a Diet Pepsi and a 7-Up, a fruit juice bottle, a bottle of still water and another one sparkling, along with a glass. The concept is cool, but mainly unnecessary. The one things I really can’t wrap my mind around is the fact that this mini-bar is room temperature, and I just can’t figure out why they would fail to see how silly it is for a first class passenger – who is able to at any given point in the flight request virtually ANY drink at the appropriate serving temperature – to be offered a personal mini-bar full of lukewarm drinks. Having said that, I have taken their warm giant Voss water bottle from the mini-bar after landing in Dubai knowing I’d be parched once we left the plane. Storage in this suite is pretty simple. There are no overhead bins in first class (that’s for economy down below!) so all of your carry-on bags go under the screen area, which is spacious enough to store at least one carry-on, your nice Emirates pajama bag, your backpack and a few items more. Now, when it comes to smaller items, like say your Bose noise cancelling headphones, you have a bin to your side with no cover, and another next to it with a cover. I chose to shove my pillow into the open bin and then throw all my random stuff, such as phone, passport, GoPro, in the covered one. If you decide to change into your pajamas – and let’s be honest, why wouldn’t you? – you can neatly hang your clothes from a hanger in your personal closet, which is located in between seat rows. For all other items you might need at easy reach, there’s plenty of surface space on either the counter under the screen or your side table (aka, top of your mini-bar). 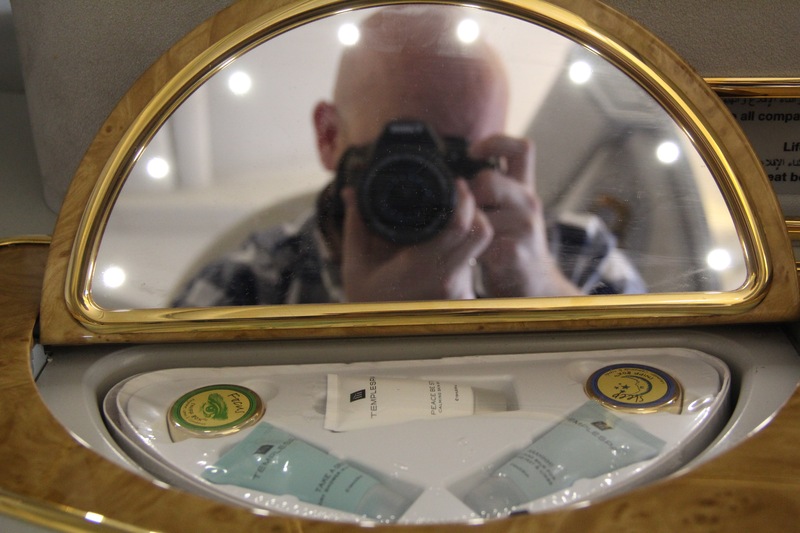 Emirates provides a small vanity mirror on the surface in front of the screen, which can be popped open just by pressing and releasing the lid. Once open, it reveals the mirror on the underside of the lid and an insert with a few skin care and aromatherapy products. It’s all pretty silly to me, but I have brought it with me as a present to friends. Etihad Apartments is a superb product, where design and style have been clearly at the forefront of its conception. 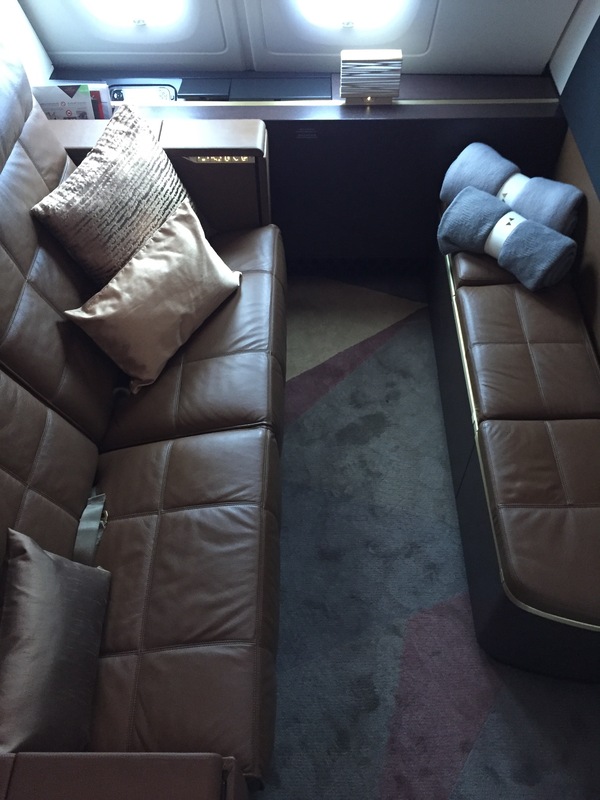 The Apartments, along with the Residence, are in the upper deck of their A380s and have space for nince passengers in the first class cabin. The Apartments are extremely spacious (aka, there is a bed and a seat…). These are some of the highlights of flying their top notch service. The seats on the Etihad Apartments are GIANT. They felt really comfy and spacious but I didn’t even realize how ridiculously large they were until Jon showed me a picture he snapped of me sitting down. It makes me feel like I shrunk down a few sizes after the Abu Dhabi heat. I loved it. When I think of oversized couches or chairs, I think of the most uncomfortable things in the world, since they usually involve my legs hanging free and the small of my back about four inches off the seat back. It’s fully adjustable into several positions, as well as its legrest. One extra cool feature I enjoyed very much was the massage settings on this product, where you can select different options for types of movements, areas and even intensity. Just like before, the Etihad Apartment is your own private space in the sky, but this one really feels like an apartment (well, maybe a New York City apartment). Your apartment can be closed off for extra privacy, but you have to drag the screen doors yourself to do so – which in my opinion feels a bit rudimentary considering all of the other luxuries surrounding you. If you, once again, are flying with someone else, you can request adjoining apartments. We chose 3A and 4A, which are both window seats on the left side of the plane and are both connected; while seated, you can’t see each other’s face, so it makes it a bit weird if you want to have a conversation, since you’re separated by a giant screen, but once you’re up in the air, the dividing wall between apartments can be lowered and both apartments will be connected. The seat does not recline into a full bed. Why you ask? 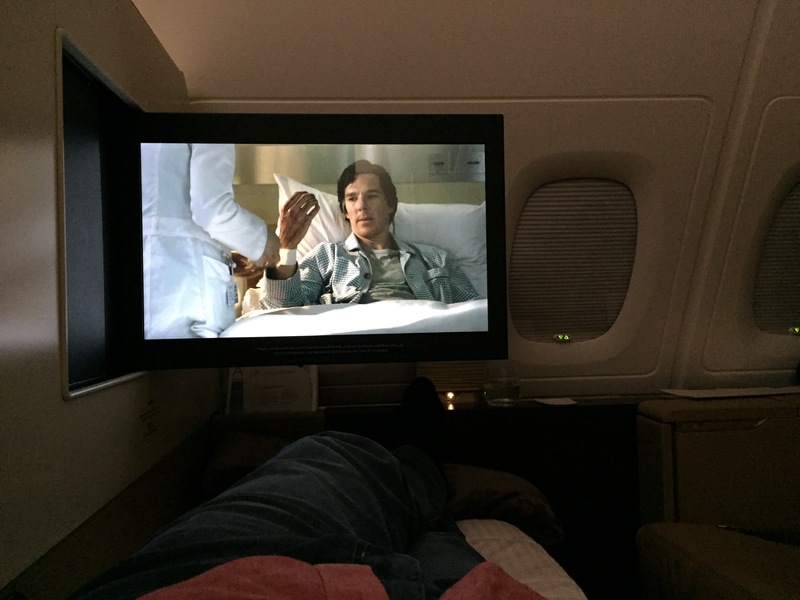 Because in the Etihad First Class Apartments you have your own goddamn bed! just in front of your seat, spanning the whole width of your apartment, there is a very comfortable and stylish sofa. This is where I spent most of the time as you can talk to your apartment neighbor from this sofa much more easily. 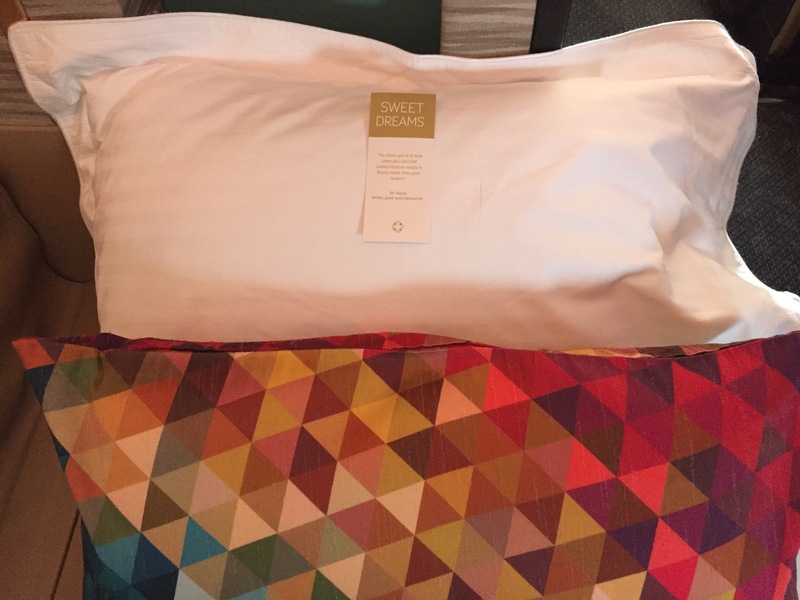 Once you request your turn down service, this sofa is expanded into a bed, with a mattress pad added to it, along with sheets, a duvet and a pillow. I had the best sleep ever in this bed and I snored SO loudly I woke myself up. 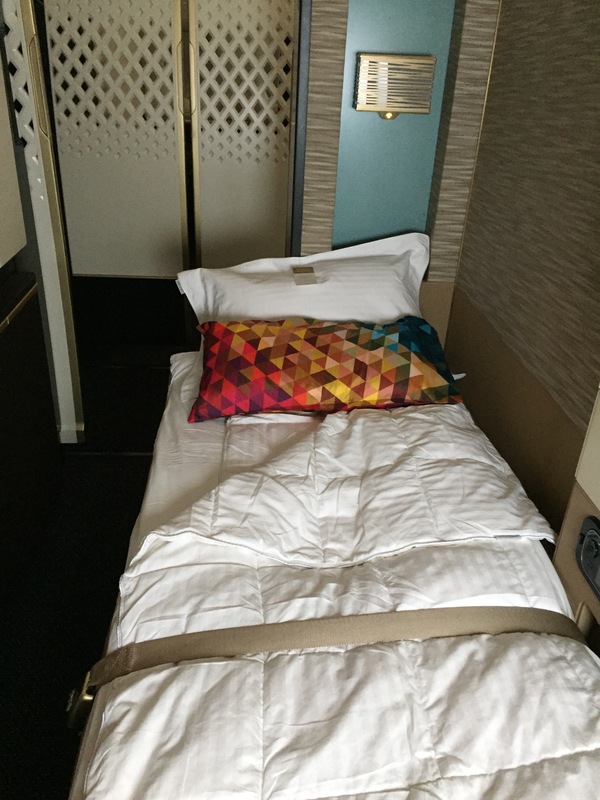 As you reach your seat after boarding, you’ll find the coolest looking throw pillow in your seat with the color palette and design details you’ve come to expect from Etihad. It is, however, only useful for lumbar support and not at all good for sleeping as the material doesn’t mesh well with beards and makes your face sweat. You are, however, given an extra pillow when your bed is made which is for you to sleep on. I felt like that pillow wasn’t stuffed enough and I should have probably asked for a second one. The material was super soft though. 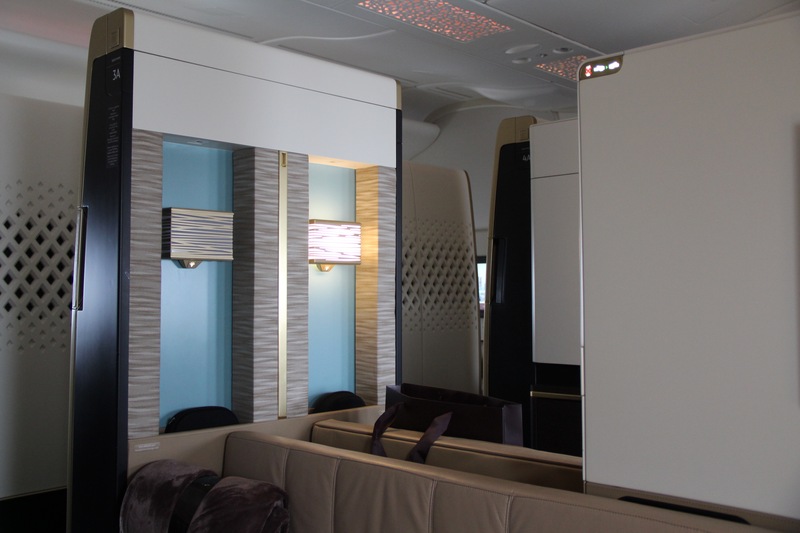 The Etihad in flight entertainment screens are 24″ and also touch screen, as seems to be the trend in modern aircraft. There’s also a remote control on your armrest, once again considering that the screen is substantially far from your seat. This screen pops out and swivels in case you want to migrate from your seat to your couch, and even so that you can continue to watch as you fall asleep. Once again there are tons of options when it comes to movies, shows and games and the image quality is really good. 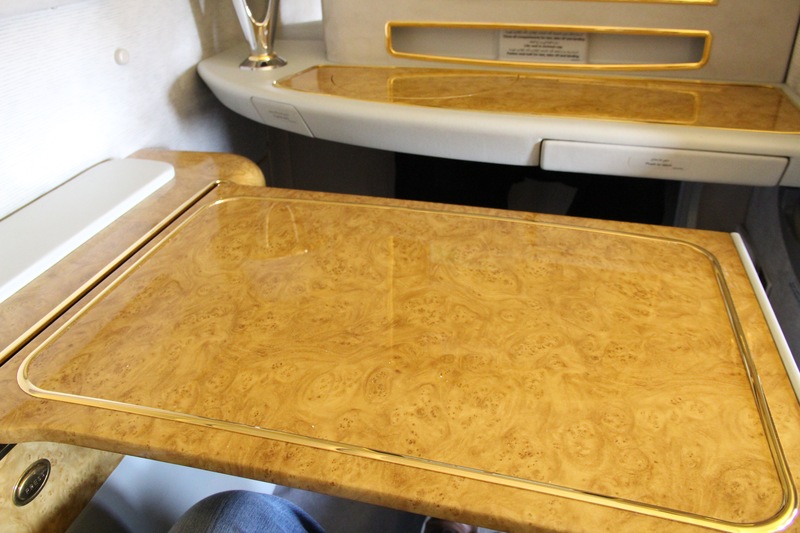 Once again, this isn’t your run of the mill tray table. It pops out of your armrest and is huge and very stable. One of the things I like the most about Etihad Apartments is the fact that you can invite people over into your apartment, and not just to lounge, but also to have a meal with you. Jon and I opted to dine together, so I visited him on his apartment. This ended up being a bad idea for me, as I ended up sitting on the couch while he sat on his proper seat; the back seat of the couch is in fact the IFE screen, which not only is touch screen and would play, stop, rewind and fast forward with my every move, but also irradiate a significant amount of heat into my back. I did, however, not care too much as the seat was comfortable and space on the table sufficient enough for two people and two sets of china. Jon, being considerably larger than I am, kept kicking my shins all throughout dinner. Barring that, the concept of dining together face to face with someone else you’re traveling with is an absolute win. 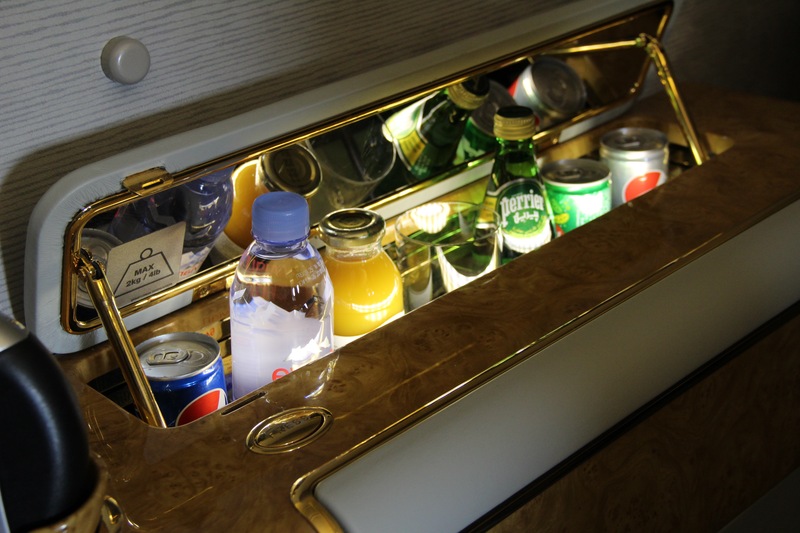 Since it’s so impossible for someone to find any drinks at any time on a first class cabin, a mini-bar has been graciously provided for passengers on the apartment who feel thirsty at any point. 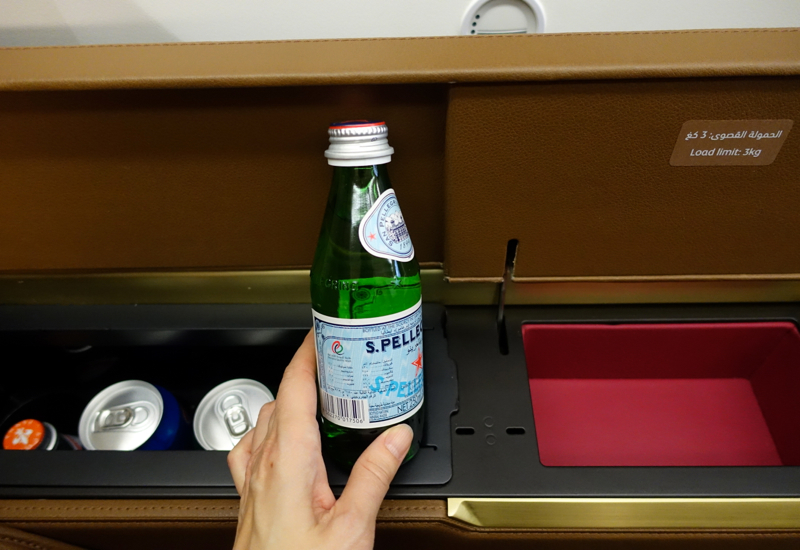 Stocked with Coke products and sparkling and still water bottles, Etihad has the advantage that this mini-bar keeps its drinks chilled. I wouldn’t expect anything less from the airline who seems to have thought of all the details. 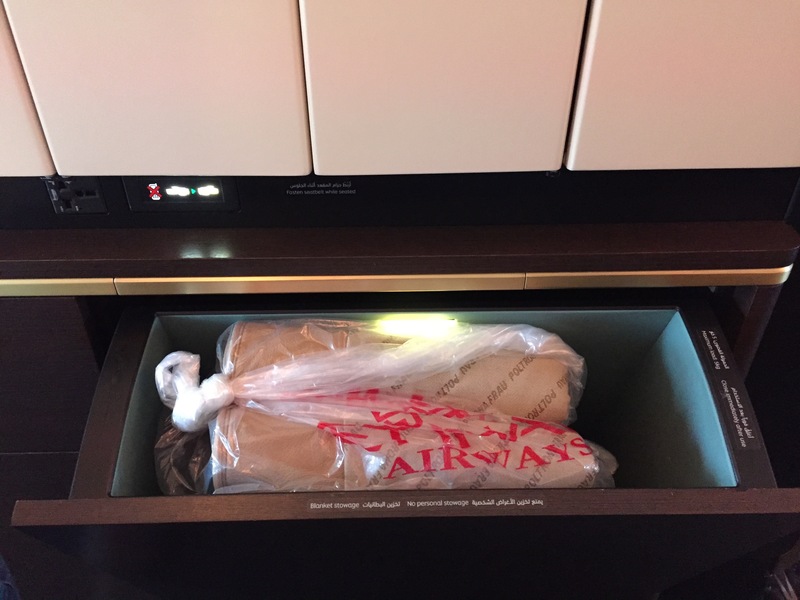 To save you from having to haul your stuff up into overhead bins, Etihad too has done away with them and allows you to store your carry-on and small bags under the seat in front of you (aka, your couch) so basically you could line up three carry-on bags and have some leftover space for a backpack there too. My small carry-on was half an inch wider and didn’t allow for the latch to close once shoved in, so after apologizing for the terrible inconvenience, my lovely member of the crew disappeared with my bag in half a second. Not sure where it was taken, but since I didn’t need it at all during the trip I was happy to see it gone and out of the way. If that wasn’t enough, there’s extra storage space next to your seat and around your seat in bins. 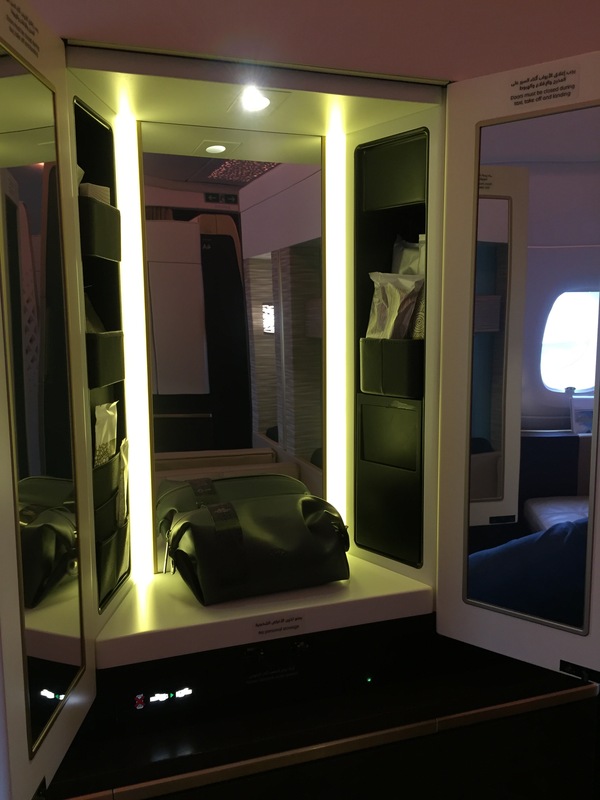 In a surprise move to no one, Etihad equipped their apartments with a full on three mirror vanity area, located in the panels next to your seat at the entrance of your apartment. 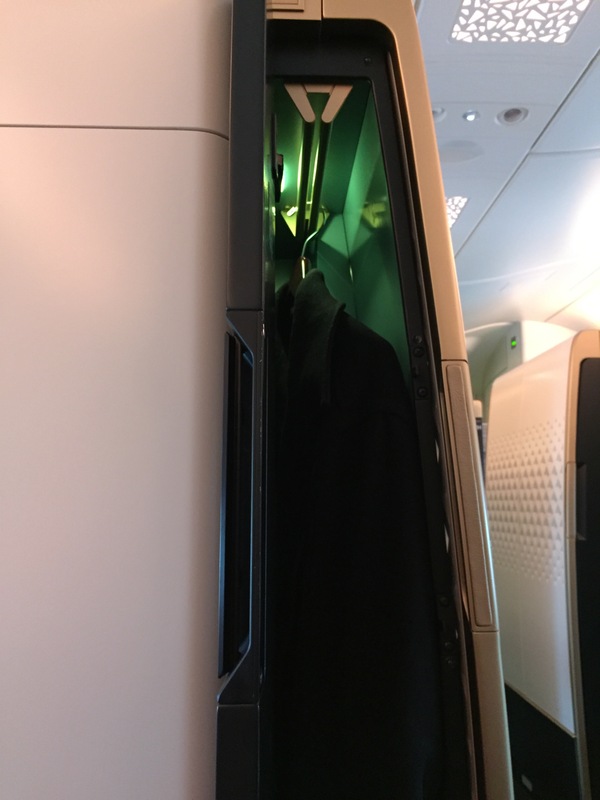 The two doors need to be pushed and released to pop them open, and they hide the amenity kit and its products arranged in the small pockets on the sides of this cabinet. The kit comes empty, and the idea is for you to stuff it with all the products you feel like bringing back home with you. Not sure what anyone would need these mirrors for other than applying make up after a long night of sleeping, but I’m sure they just put it in there because they could, and I’ll take it because it doubles as storage for all the crap I’m always hauling around. While the difference between these products is negligible in the sense that they are both pretty freaking amazing, there are definitely some details that are better in one than in the other. In my opinion, and as clearly expressed by my absolutely non-scientific display of results above, both products are incredibly above average and I would be glad to fly either again, but one of the things that definitely does it for me is the ability to dine together with your companion, which is not something widespread in many carriers and I would love to see more of sprouting up. The second point that does it for me is the additional bed separate from your own seat, which is not only extremely comfortable but also convenient. Have you had the pleasure to experience either of these services?